There’s just been a short rain shower – enough to stop me being outside in it – but as soon as it stopped I was out there to meet the unwelcome visitors that are enjoying my green finger skills. The French Bean ‘Blue Lake’ that I planted out only a few days ago, have seen two of the plants stripped completely of buds, shoots and leaves. These snails move fast. But today I moved quicker, and with the rain on a momentary pause, I went out and immediately pulled 8 small snails off of the beans. It seems that they’re using other plants to get them up and onto the bean leaves… and then they work their way up or down, decimating the plant until it’s a just lanky stem resembling a continuous chain of arms and elbows. I don’t know if they’ll re-grow, but i’ve got seed. This Rose was already in the garden when I moved here. 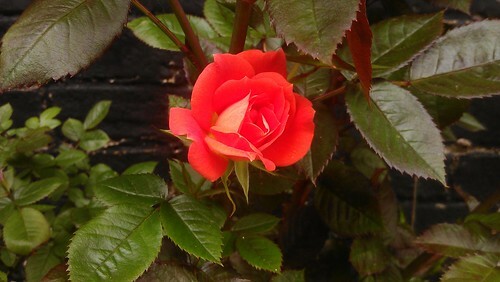 Not far away, is the Rose (of an unknown variety). It was already in the garden and clearly hadn’t been in place for many years. Still, it has flowered without fail – sometimes reaching two seasons of flowers in a year. This year though, after pruning it hard, it is full of lush growth and green leaves, and lots of buds. Today, it is also full of lush green aphids. The Aphids have moved in. I just hope they don’t spot the Sweet Peas nearby. Having witnessed them obliterate last year’s sweet peas, I was gutted. There’s not enough Ladybirds around yet to feast that lot, and the Hoverflies aren’t about due to the rubbish weather… so it’s down to some manual techniques to usher them away – a piece of tissue and some careful squeezing (not to damage the rose buds), or maybe some diluted washing-up liquid. Aphids breathe through their skin – so if you clog that with an oily washing-up liquid mix, they suffocate and die. Gruesome but fortunately true. Again, not far away are this year’s Sweet Pea ‘Cupani’ – they’re looking stunted at the moment, and not much different from when I planted them out weeks ago. 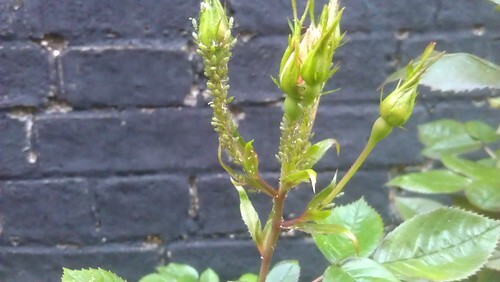 I know that the aphids will show them no mercy, so I will need to deal with these aphids sooner rather than later. For now though, it’s the snails that are top of my hit list.